Collectable Toys generally covers those toys produced in the Victorian, Edwardian and Pre World War II periods. The Germans were particularly reknowned producers of pressed-metal toys, particularly with clockwork mechanisms. The manufacture of German clockwork toys was centred on Nuremberg, which had already developed as a major clockmaking centre so the skills to produce clockwork toys was on hand. 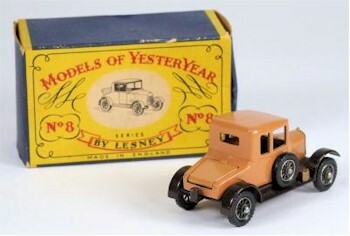 An Extremely Rare Lesney Models of Yesteryear Y-8 1926 Bullnose Morris Cowley with Tow Hitch (SC20/1022). Typical pressed-metal and clockwork toys produced during these periods include boats, aircraft, clowns and other figures, cars and motorcycles. Outstanding manufacturers include Ernst Paul Lehmann and Marklin in Germany, who proved themselves to be world leaders in quality and design, with their pressed-metal and clockwork toys being exported in large quantities. Bassett Lowke was the leading toy manufacturer in England with Carette being particularly notable in France. We also see a range of other toys being entered into this category such as so-called penny toys and other 'knick knacks' which often have a charm of their own. 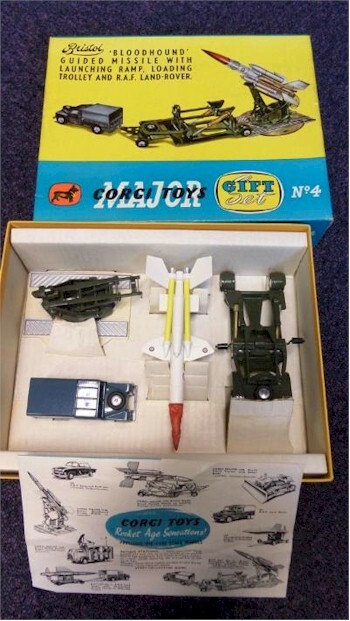 A Corgi Gift Set No 4, Bloodhound Guided Missile (SC20/1052).